Bengal cats are beautiful, exotic, and as explosively popular as a fairly new breed can be. A breeder is a great resource for expert tips on how to choose a Bengal kitten for a pet. Meet Alisa Coffey, breeder and Bengal lover of Belrouge Bengals. Alisa agreed to sit down and answer our burning questions about this most unusual breed. Alisa, would you explain exactly what Bengal cats are for the benefit of any readers who aren't familiar with the breed? The Bengal cat is a hybrid named after its beautiful wild ancestor, the Felis Bengalensis or "Asian Leopard Cat." They have been called Living Room Leopards for the exotic beauty and movement they bring to a home environment. The Bengal's long legs, striking patterns and elegant stride remind us of a much larger wild cat, but they are a fully domesticated breed with the most amiable of personalities. They are smart, social, energetic and playful. How do they compare to the average house cat? Your average house cat may be willing to give you a kitty kiss or two, run after a ball or jump up to catch a toy, but Bengals are the movie star house cats. They give kitty kisses in excess amounts, play fetch, and jump up even 6 feet in the air to catch a toy. Our house record is 6 feet 8 inches! Bengals aren't much bigger than the typical house cat, ranging from 12-15 pounds for females and 15-18 pounds for a male, but they are sometimes much longer. They can endure hours of stimulation without needing a kitty nap. I have heard them called the dog lover's cat. You know the way a dog comes to you with their favorite toy to say, "Hey, let's go play"? Bengals do the same thing. Whatever you train them to do becomes a part of their personality. When my alarm clock goes off at 7:00 a.m., I can expect kitty kisses and at least one toy to be brought to me to start the day. If you take a walk at 3:00 p.m. they are ready to go with you. Playing fetch in the pool? It's a real possibility that they will join you. Taking a shower? You can be guaranteed a visitor, if you didn't remember to lock the door; shutting it won't suffice, because they are excellent locksmiths. 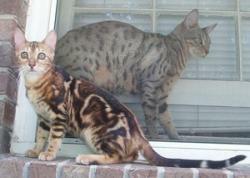 Since Bengals were originally bred from wild stock, are there any temperament issues with this breed? No. Sometimes people will exclaim to new Bengal owners, "You are buying a wild cat!" This just isn't the case! Bengal lines are carefully selected to insure the most loving, loyal, energetic and enthusiastic kitty to ever prowl the living room rug. When visitors come over there is no "Oh, the cat is somewhere in the back". A Bengal is the first to greet you at the door, instantly sociable. While they are loyal to their owners, they are very hospitable to their visitors. They also make excellent therapy cats. For someone who is having a difficult time starting their day, a kiss on the nose might be just what they need! Our Belrouge Bengals have a fairly regular schedule. When the alarm sounds they are instantly by your bedside attempting to wake you up. Bengal cats make sure to spread all the love they have around the entire family. If we ask where one of the cats spent the night, we can all be guaranteed to exclaim that the cat slept with us. At some point in the night he/she was with one of us, making sure we each got our own bit of Bengal love. 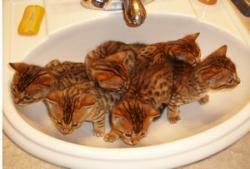 Tell us a little about your own experience as a Bengal cat breeder. 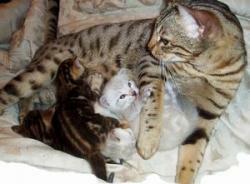 My favorite part of being a Bengal cat breeder is watching the queens as their motherly instincts take over. They clean their new babies, love on them and teach them to play. We have a drawer where we keep all of our kitty toys. All of the moms know where it is; it is easy to smell the waft of the catnip. When their babies are about a week old, the moms go and get toys for their babies from the drawer. All twelve toy mice, the glow in the dark balls, the catnip stuffed carrots and hearts, foil teasers, feather teasers, tail chasers and even the laser chaser all are delivered by mom to the kitten birthing area. My daughters and I laugh at how much each mom is ready to play while the babies are just opening their eyes. "Look at the way they walk just like a leopard." "Oh, it looks just like a wild cat, but it's so sweet." "It is so soft, it's like a mink." "I can't believe they come right to me". People are surprised by the way these cats will let us hold them on their backs like babies and rub their spotted tummies. A couple weeks ago I was showing a new owner how to trim her kitten's nails and he fell asleep in my hands. It is so much fun to introduce our cats to people. Of course there are challenges; a breeder needs to know quite a bit about birthing to assist the mom, if she has difficulty. We often adjust our plans to accommodate a birthing. I just hate to leave them alone during that. We screen our clients to try to make sure that they will be a good match for one of our Bengals, but letting the kittens go to their new homes can be hard. There is usually at least a few from each litter that steal our hearts. Fortunately, we get to see most of them again either at shows, in pictures or around town. We want to enjoy breeding and we want all of our kittens to find new homes before they are adolescents, so we don't breed litter after litter. In fact, we subscribe to a code of ethics that emphasizes discriminate breeding based on strong evidence for finding suitable homes for our kittens, as well as ensuring good health, stable temperament, intelligence and desirable appearance. That means that we really do have to use a waiting list to plan future litters. In your estimation, is the breed gaining popularity? They are probably the most popular show cat in the USA right now. The Bengal is represented at any TICA cat show, and it is likely to be the majority. A lot of really famous people own them and carry them around town in pet bags, on leashes and on their shoulders. It's been reported that Paris Hilton, Leila Ali, Lord Archer, Jonathan Ross, Kevin Bacon and Hugh Grant's girlfriend Jemima Kahan are all Bengal cat owners. Bengals are found on the front of cat food bags, on cat litter commercials and in print. I have new clients who tell me they saw a Bengal walking around on a leash and now they must have one. Bengals are definitely stars. Tell us about Snow Bengals. Reminiscent of the big Snow Leopards, Seal Lynx Point Snows were the first snows that breeders started to develop. The Lynx Point carries the recessive color point gene that comes from the Siamese cat. They are born with striking blue eyes that they keep even as adults. This is the only type of Bengal with blue eyes. In the late eighties, the Burmese cat was introduced into some of the Bengal cat lines. This produced a line of darker Snows, the Seal Mink and the Seal Sepia, which is the darkest Snow. The Snows are very beautiful, but they are only one of the colors of Bengals. There is an article on my website that goes into greater detail about Snows and how to tell them apart. One of the newer things available through UC Davis is DNA testing, which is a good way to verify type and lineage. All of our Bengal cats, including our Snows, come from Supreme Grand Championship lines. We do a lot of screening to weed out traits that we don't think should be passed on, and to really enhance the good qualities that we see emerging. We are very happy with the long athletic build, puffy whisker pads and prominent chin that our cats have. 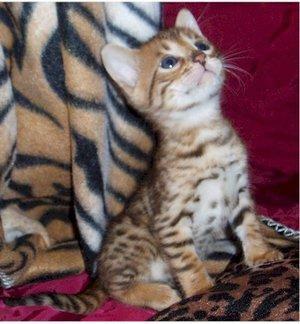 What is the average price range for a Bengal kitten? Prices can be all over the board for this rapidly developing breed. In 1998, a foundation Bengal was sold in England for over $40,000.00. That was the world's record for the most expensive cat ever sold. Time has made prices a little more reasonable and varies greatly depending on the type and quality of kitten you want. A nice show quality cat will probably run $2,500.00 - $5,000.00 or even more. Pet prices run $650.00 at the low end to about $1,250.00 for a very nice pet. The thing to remember is that you usually get what you pay for. For a pet that is healthy, well bred and well socialized, $1,000.00 should do the trick. What advice do you have for anyone considering bringing a Bengal into his/her life? Be sure this is the kind of cat that you want. Don't buy on impulse. Bengals are beautiful, but they are not accessories. Visit the cattery and meet your cat in person, if at all possible. This will be a new member of your family. Choose a good breeder. There are some tips on my website about how to do that. Make time and take the time to introduce your cat into your home the right way. Welcome them like a new baby, with love, attention and toys. Follow the breeder's guidelines for feeding, health and training, so that your kitten will be healthy and have good habits. 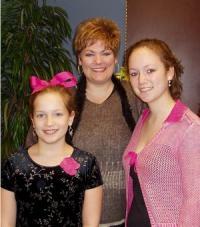 Whatever you train them to do they will want to do, because they want to be a part of your life.